Categories: Azhwars, Sri Swamiji's Kirtans. About 500 kilometers south of Kanchipuram, which was the holy kshetra we visited last month, is the town of Tirutangal. Geographically, this town is located in the Virudhunagar district, about 3 kilometers from Sivakasi and about 20 kilometers from Srivilliputhur, the birth town of Andal. 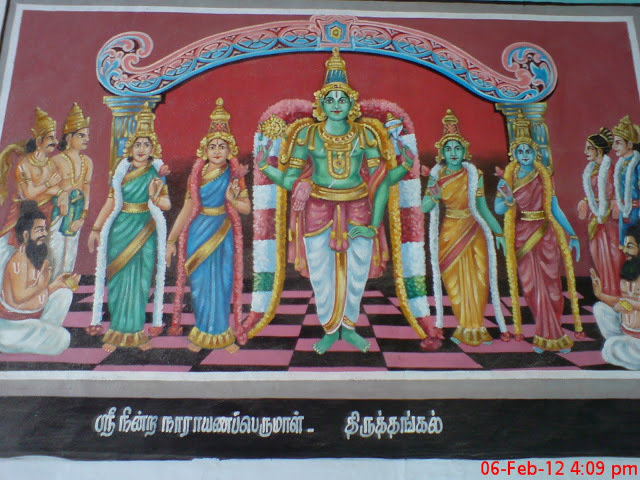 Tirutangal is a divyadesam and the temple is found on top of a hill called Tangal. 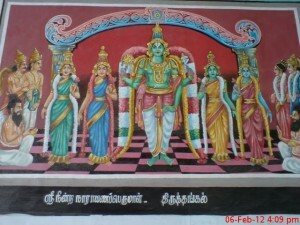 The main deity of the temple, is known as Ninra Narayana. As the name suggests, the Lord is found in the standing posture. His consort, Goddess Lakshmi is known as ‘Sengamala thaayar’. She has a separate shrine and interestingly, she is also found in the standing posture. Goddess Bhoomi and Goddess Neela are also present here. Legend of the temple says that once the three consorts of the Lord had a small argument about who was superior. Goddess Lakshmi came down to the “Tangal” hill and did penance. The Lord was pleased with her and deemed her superior. Since, Goddess Lakshmi came and did penance here, the place came to be known as Tirutangal. Among the Azhwars, Bhootataazhwar and Tirumangai Azhwar have sung hymns on this holy town. Sri Sri Muralidhara Swamiji too has composed a beautiful song in Raga Simmendramadhyama describing the virtues of the Lord. The lyrics and the meaning are presented here for you to read and enjoy.